I'm trying to create a proxy basically scenario is 2 endpoints sending info to single proxy and want to capture what endpoint has sent what data in the data source. I want to capture source IP and info from JSON data bank in the data source that can be used as a data source correlation for other responders. You may use the "REST URL Databank" (introduced in 9.10.2) to capture the Host "IP" that is included in the Request. If you do not have the latest version of SoaVirt, you may also use the text databank to isolate and extract the desired information. I'm using 9.10.1 and I don't see "Rest URL Databank" so I will try to upgrade and will update this thread. I was able to extract the host but that is more of a destination vs the source e.g. If IP-A is sending the request to IP-B and I use "Rest URL Databank" on IP-B and extract host I'm seeing IP-B vs IP-A. This is the sample traffic. I'm interested in extracting this line "Source: 127.0.0.1 - 127.0.0.1"
Please verify that you are chaining the databank as an output to the incoming transport header in order to capture the "source" details. So is this a problem and not working as expected or setup issue? I apologize for my confusion. The REST URL databank can capture the details contained in the request including the host where the request is being sent to (destination). However, if you wish to capture the IP of the machine where the request originated from, the IP information needs to be included as part of the request. Currently, the easiest option would be include the IP as a custom header in the request so that you may extract it in the responder. 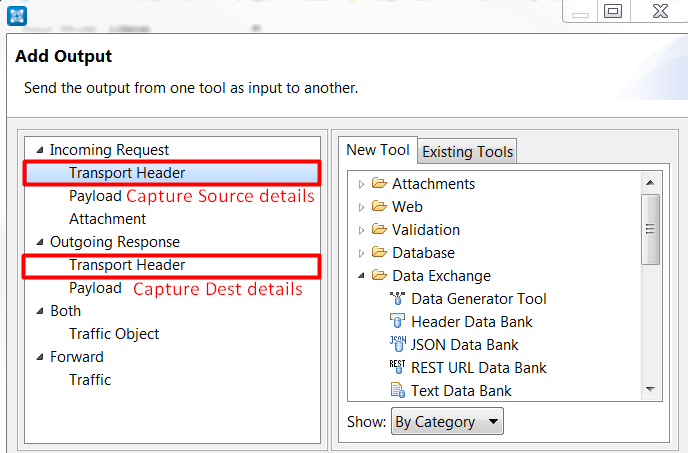 The event details log contains the source/destination information, but I am not aware of how to access this information at the responder level.